• Viewing characteristics: the type of plot being displayed, the perspective or point of view from which you see the plot, and the presence or absence of borders, enclosing boxes, axes, and back planes. • Color and line formatting: how the plot will mark points; how markers will be connected; and the format of any lines connecting markers. 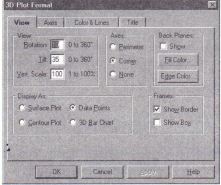 • Choose GraphesSl) Plot from the Format menu. Alternatively, double-click on the plot itself. 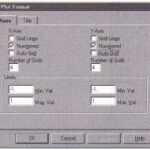 Mathcad brings up the 3D Plot Format dialog box. The View Page of this dialog box is shown below. The remaining three tabs take you to three additional pages. • Make the appropriate changes in the dialog box. The View page of the 3D Plot Format dialog box lets you modify the general presentation of your 3D scatter plot. To change your plot from a scatter plot to another type of 3D plot, click on the appropriate button in the Display As group. You can convert a scatter plot into a Surface Plot, Contour Plot, or a 3D Bar Chart. 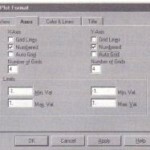 These plot types are fully discussed in the corresponding chapters in this User’s Guide. When you view a scatter plot as a surface or contour plot or a 3D bar chart, Mathcad actually interpolates a surface that approximates your scatter data, using a 21 by 21 mesh by default. To change the density of this mesh, click on the Color & Lines tab and edit the number of rows and columns in the Interpolated Mesh group. 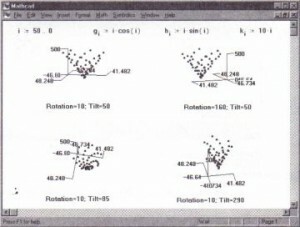 If your data is not well approximated by a surface, Mathcad may be unable to compile a useful interpolation. If this occurs, Mathcad will signal this fact with a message in the status line. integer between 0 to 360 degrees. The effects of varying the rotation and tilt (as well as the scale) of a scatter plot. • Increasing the rotation turns the plot clockwise. • Tilt controls whether you see the data edge on or whether you look down from directly overhead. • Click on Show in the Back Planes group. A scatter plot with a border around it and with back planes showing together with the same plot enclosed within a box without showing back planes. 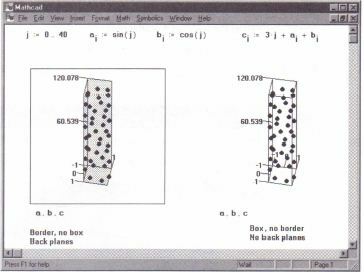 Using a border or an enclosing box on a scatter plot.